RALEIGH, N.C. (AP) — Devon Daniels didn’t fret or change much after a pair of bad offensive outputs to start his North Carolina State career. 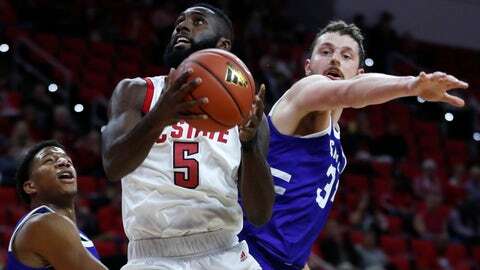 The Utah transfer scored 20 points to lead the Wolfpack’s latest high-scoring performance, a 100-49 win against UNC Asheville on Tuesday night. N.C. State shot 54 percent and led big nearly all night, pushing the margin to 29-7 with 5½ minutes left before halftime to remove all doubt on the outcome. Tajion Jones scored 21 points for the Bulldogs (1-1), who missed 13 of their first 15 shots to get in a fast hole and committed 24 turnovers — several coming in the backcourt against pressure. The Wolfpack converted those into 33 points. N.C. State: Add another lopsided win for a team that outscored its first two opponents 200-104, though Johnson’s departure — along with the recent transfer of freshman forward Ian Steere after 5 minutes of opening-night action — left the Wolfpack with nine players for most of this one. Johnson, last year’s ACC assists leader, left at the 16:24 mark after being blindsided by a backcourt screen from Jeremy Peck. He was down for a time and wobbly while being helped off the court. He was quickly ruled out and didn’t return to the bench until the second half. Keatts said afterward that Johnson would be evaluated by doctors Wednesday, but added Johnson wasn’t diagnosed with a concussion.